Trail angel Uberducky stopped the truck where the pavement ended, just as he had declared he would. It was still an eight mile hike to the PCT trailhead, but he didn't want to negotiate the potholed gravel. Reluctantly I embarked on the road walk. Road walks are the worst, because they don't count. I added up mileage in my head. If I had to walk all the way, this would increase this small section's mileage to 53. Still doable in two days, but not easy. After I had walked two miles, a car pulled up. "Need a ride to the trail?" the people inside asked. Success and I hadn't even had to hitchhike! This trip was getting off to a good start. This 45 mile section of the Mount Jefferson Wilderness was closed last year due to the Whitewater fire, and I seized the opportunity to hike it when I was in Bend for work. During the workweek, my co-workers and I stared glumly at the brown sky and checked the air quality index: unhealthy. Foolishly I ran in the mornings, passing other obsessed souls. This condition was prevalent last year, too. I feel like some areas of the West are basically becoming uninhabitable. But by some miracle, by Friday the stars aligned. A brisk cold front swept the smoke away. I trotted along the trail feeling exuberant. There is just something about this ribbon of trail that does it for me. I am at the point where I am counting down the miles left instead of counting up. After this section, I would have only 350 left. I passed numerous small lakes, taking a lunch break at a windswept View Lake. Waves of northbound thru-hikers passed, all smiles because of the improved air quality. With about six hundred miles to go, they are on the homeward stretch, but they also know they need to beat feet to get to Canada before the snow sets in. And it feels like fall. Though the lakes were beautiful, it was much too cold to swim. I climbed up over Peak Ridge and down into Jefferson Park, a place of such magnificence that it was hard to keep eyes on the rocky trail. There's a permit system here, though, to camp near the lakes. And I had only come 12 miles, so onward I had to go, though I hated to leave. Near Russell Creek, a notoriously dangerous crossing, I encountered both the rumors of a horse carcass and Scratch, a Oregon thru hiker who kindly waited to watch me tentatively cross on slippery rocks. I hate crossing on rocks or logs, but the alternative, a swirling mass of whitewater, didn't look safe at all. We then entered a completely burnt forest, casualty of the Whitewater fire. The fire had completely cooked this area, and former campsites were guarded by standing dead trees. Back in Jefferson Park I had asked a thru hiker if there was anywhere to camp outside of the burnt forest. He shrugged. "No trees fell on me," he said. After three months and change of camping every night, thrus are somewhat cavalier in their campsite choices. The burnt forest went on forever, and the hours ticked on toward nightfall. I began to worry about finding a campsite. Night hiking is not my favorite. The trail wound down to a large stream crossing, and I was elated to find a ledge next to it. A private spot, the sound of a river, and it was still light enough to wash up. The perfect trifecta. Scratch appeared and set up next to me, with several other hikers tucked into the bushes across the river. Thru hikers kept showing up and most continued on through the night, into the burnt forest. Not my idea of fun. Eighteen miles plus two on the road walk. It had been a good first day. I couldn't wait to see what was coming up. I haven't hiked solo on the PCT for a while, and I was really enjoying the freedom. With the exception of Flash and Beekeeper, two great hiking partners, I couldn't think of a better way to do this section. I was meeting more people and having more fun than in years. This was turning out to be a perfect hike. Perfect campsite by Milk Creek with Scratch in the background. Long distance hikers call it "getting your trail legs"--that moment when you can march along feeling invincible. In California. a hiker named Breezy sat with us on the PCT this year, and mused about it. "In the beginning, I used to see hikers on a switchback and know I could catch them," he said. "Now I can't catch anybody. We've all gotten so fast." Though I don't feel slow, there have been times when I have definitely gotten my trail legs. All those times, it took at least ten days of hiking, every day, all day, to feel the change. Once was on the John Muir Trail, and I strode up Forrester Pass at a rapid clip, unstoppable. The other two times were also on the PCT, in two separate Washington sections. On one, we had just completed a 23 mile day and I felt like continuing on forever, not wanting to stop. The other time, Flash and I had resolutely stuck to our 16 mile days, until we didn't--we were getting to our planned campsites by two in the afternoon, and heading on, our new normal becoming over 20 miles. It was the same way when I used to run long distances. "Let's do twelve miles and see how we do," B proposed one day to three of us. Twelve miles! It had been forever since I had run that far. It was daunting, and we shuffled through. By the end of marathon training, we were ecstatic at the thought of running "only" 16 miles. Things had clicked, and we floated along on our marathon legs. As a weekend warrior, it's hard to keep your trail legs. On a good work day, I might have an hour to exercise. I throw myself out the door with abandon, trying to see how far I can run/bike/hike before I am called back to a conference call. So the weekends are it, and I make the most of them. Lately I've attempted a few difficult hikes. I embarked on the trail to Maxwell Lake, which is only four miles one way, but includes a heart-sinking climb in the last mile. I may have whimpered as I slogged upward, the one hundred degree temperatures not helping much. On the way down, I passed some defeated hikers, the heat and the climb just too much. Then I went to Echo Lake, not for the faint of heart either, gaining almost three thousand feet in the last three miles. This is so hard, I thought, didn't it use to be easier? But of course it didn't. I had just forgotten the steep scree, the trail going straight to the sky. I reached the lake and threw myself in. As I left the lake the following morning, congratulating myself for making it without dying, I encountered a trail runner I knew. We were back on the main trail, and I wondered where she was going. "Eagle Cap!" she proclaimed. Okay, that was just a 35 mile run. Feeling slightly less badass, I continued on. It's a good thing I am not very competitive. Just with myself. Some people do this as a day hike. It's a long one, 16 miles. I decided to camp. And in this, the fourth weekend of successful hiking, I went to Dollar Lake, a twelve mile round trip. This place is wide and empty, with sweeping, long vistas and few trees. It's not a place many people go. Ruby races at full speed along Dollar Lake. She always has her trail legs. As I hiked along, I realized the stars had aligned. Trail legs! My legs felt like they were on springs. I reached the first lake, Bonny, in less time than I ever have. Not that I was even trying. But still. Bonny was looking a little swampy this late in the year, so I continued on, up and over the pass. I left the trail and went cross country to Dollar Lake. As always, the wide open country didn't disappoint either of us. We looked far into the distance, to all the places we couldn't reach, but maybe someday, we could. I know my trail legs won't last--I don't have the time to hike all day, and there's no use in wishing I could. It's possible that because I can't, I enjoy it more than someone who could. It's all right though--I know I can get them back. Give me a chunk of time, a few hard hikes, and they will return. 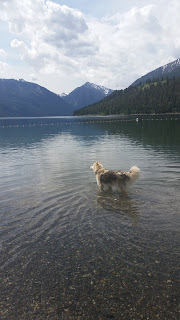 I step hesitantly into Wallowa Lake. In a shortie wetsuit, swimsuit, neoprene booties, and a swim shirt, I am way overdressed among my friends. MB is unfazed in only her swimsuit and a ball cap. She swims with her head out of the water because she has a fear of fish. I have no such fear, but I do fear cold. This lake is deep, at its deepest 300 feet, and cold. It is a ribbon lake, formed by glaciers, and is still fed by snow melt. In winter, it sometimes freezes. The surface water warms up superficially, but about 140 feet below, it is nearly always 40 degrees. I can feel those pockets as MB and I stroke toward the dock that is our turnaround point. Even in all my layers, I shiver. It has been a record-breaking summer, with temperatures scraping 100 degrees. Still, I can't stay in the water without my wetsuit, unlike the other swimmers in our loose posse. We dodge the kids and their inflatable toys, the stand-up paddlers, and the occasional water skier, and head for the no wake zone. As I swim, I can look far, far to the bottom of the lake, farther than I could dive. "You look comfortable in the water," Kim says later, and I am glad to hear it, thinking of all the decades that passed before I learned how to swim. I am grateful to the Sitka salt water pool and the masters swim hour that allowed me to minimally learn enough strokes to get by. There are so many things we tell ourselves and sometimes we believe them. For years I thought I had bad balance and couldn't ride a bike, ever. Now I do. I thought I couldn't be strong, and I was, working on a trail crew and fighting fires. I thought I couldn't be a swimmer, and here I am, out in a deep lake. What do you tell yourself that isn't true? MB has perfected her modified dog paddle and she is a speedy thing. I have to work to keep up with her. We pass the summer homes, festooned with kayaks and canoes. Once a dog swam out from one of those, colliding with me in the water. Treading water, I point out the farthest I have ever gone: the buoy past the silver dock. We won't get there today. Commiserating over scheduled conference calls, we head back. It is so warm that for once, I don't drive home with my heater on or jump immediately in a hot shower. The house bakes in the triple digits, but I feel cool for hours. Pretty soon our swimming will be curtailed as fall comes in. It's a short season, swimming with friends, but a sweet one. I won't think about the fact that there are only a couple of weeks left. I am trying to live in the moment, and this is one of them. "Did you see the naked hiker?" a couple of women asked. We were all at a stream crossing, taking off our shoes to ford. That lake looks like it's a long way down! and drop down to the horribly misnamed Swamp Lake. Swimming is the best in a high alpine lake! While it does boast a swamp on one end, it is a breathtakingly beautiful place to camp. That night it was only me and a foursome, who invited me to their camp (this is becoming a pattern). While we sat around, them in the chairs the horses had brought in, me on a rock, I watched Ruby roam around the lake. She is a FOMO dog, I explained, forever fearful of missing out. One of the women leaned back in her chair. "I'm a fan of JOMO, myself," she said. "The Joy of Missing Out." We watched a ferocious storm cloud fortunately track over to the basin next to us, rumbles of thunder heralding its approach. There was something to that, I thought. Instead of worrying about missing out, pick one thing and enjoy it to the fullest. Don't worry about what you should be doing, or could be doing. She said she was planning to sit right in the chair and read the next day, regardless of all the hiking opportunities around. I kind of love this. I'm going to adopt it. At last, freedom! I raced up the trail, elated to be done with work travel and to have an unscheduled weekend. Some friends were hiking elsewhere, but this was to be the 24 hours I needed, lots of solitude, swimming, and reading. I had picked a lake where hardly anyone went just for this purpose. I needed to talk to nobody (except Ruby). The parking lot, crammed with over 20 cars, gave me pause, but I knew all of the people were at the popular lakes. Still, use has significantly climbed in this wilderness in the last ten years. 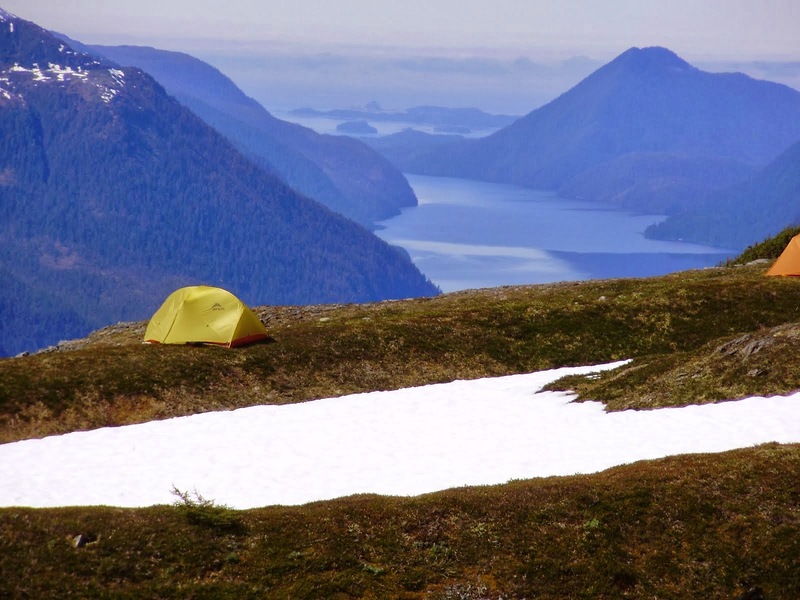 Though it's great to see people out and enjoying the woods, it's not great to be sharing campsites with them. For a hike that is probably about 12 miles, the climb to Bear Lake seems relatively brutal. It seems to take forever, climbing relentlessly. We were gripped by a heat wave too, and I worried about Ruby, who kept sitting down in the shade. I had somehow lost a water bottle and only had one liter with me, a rookie mistake. I gave most of my water to the dog, rationalizing that she was wearing a fur coat. We found some streams to water up in, but it was a relief to finally reach the final trail junction. It's not marked, and the map shows it in the wrong place, so we stumbled around for a while before finally finding a few cairns to mark the way. The beautiful clean water of Bear Lake came into view, and we wasted no time in jumping in, five and a half hours from the parking lot. We had definitely not blazed the trail very quickly--all the water stops took their toll. I set up my tent in blessed silence. Then I saw something. Was it a mirage? No, it was a large naked man heading for the water. I sighed in irritation. So much for a night of solitude. After I had discreetly hidden behind a rock, the man reappeared, thankfully clothed. He revealed that he and four other buddies were camped with mules just beyond my site. Darn it, I thought. Should I move on? But then I was surrounded by the buddies. Three of them dragged a blow-up boat to the lake and attempted to fish. Another appeared with Coors. I'm not much of a beer drinker, but it was a nice gesture. "We don't want to ruin your solitude!" they exclaimed, although they kind of had. "We're all grandpas," one of them declared. "We're harmless." Why not be friendly? I didn't own the lake. While I will never be one of those people who need to constantly be with others, there's something to be said for allowing for new experiences. For trying not to be a person who says, "I never..." or, "I'm not doing that." You can get so closed up that you miss out. I have often gone along with companions who set down the law like that. And I have regretted it. I went up to their camp later. They were friends who went to the mountains every Chief Joseph Days rodeo weekend--"Because if we didn't, we'd probably be in jail." They showed me a plunge pool where they swam. The original swimmer stared at the sky. "I like coming out here," he said. "I feel like I can be me." Who couldn't love that? Though I usually get the typical response from this demographic: "You're out here ALONE? Do you have a GUN?" Instead, they said, "We're starting to see a lot of women hiking alone. Good for you." (Though I don't really like being praised for something that isn't challenging--it's not going to the moon for Pete's sake--it was refreshing not to be lectured about it.) We sat around in chairs (!) watching the sun go down and a big moon rise. I had basically nothing in common with them--I don't like riding horses, and I don't haul in copious amounts of food and alcohol, much less a boat--but it's nice to broaden your horizons and find common ground. Maybe this was what I needed--some acceptance, some companionship that was temporary and didn't ask for anything more. The next day I left before dawn and climbed up the goat trail to complete the loop--past little Hobo, Chimney and Laverty Lakes, where all the people were. I had to hunt for the trail in spots. Little Hobo Lake. Nobody here! Chimney Lake. Plenty of people here! it's only five miles, so tends to get hammered. A regular pack train of people moved slowly down the mountain. Now that would have been horrific and I was glad I had only my buddies to camp beside. Though it hadn't been the weekend I wanted, it was the weekend I got, and maybe the one I needed. I swear sometimes she stops to take in the scenery just like a person.